Let me give you a little insight into how my brain works. It was beautiful Saturday, and after I took Shelley to the barn for clinic and I was driving over Double Oak Mountain, Muse's Supermassive Black Hole was played on Alt Nation…. so I started thinking about the baseball scene in Twilight, which led me to think about how several of my friends with boys who play baseball have had many cancelled games due to rain…. 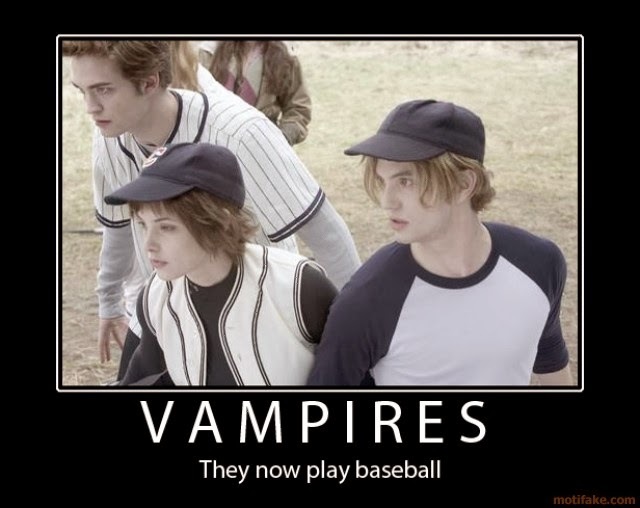 and how vampires can play baseball during storms, but not humans…. and then I started wondering if any of my friends with sons who play baseball are Twilight Moms…. So I went home and put Pandora radio on the Muse station while I wallpapered our stairs. This is a freaktastic video. It's Musical Monday, so post and share! Yep, I am a Twlight fan and some of the music is good, but the lyrics are something else. I am a huge fan of Twilight and I loved that song so much, I had my husband download it for me.